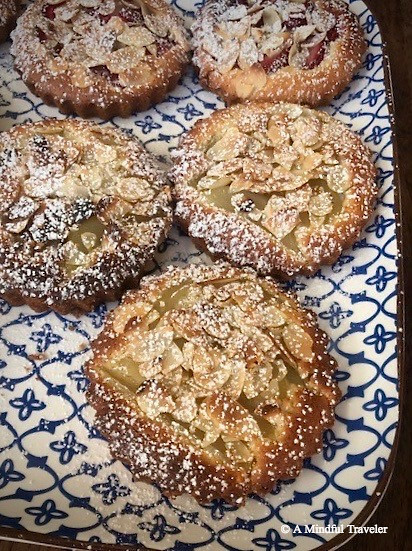 Amidst the Patisseries and Boulangeries within the French country town of Saint Remy de Provence, and the surrounding villages , one is surely lured to the sweet calling of tempting homemade cakes and pastries. 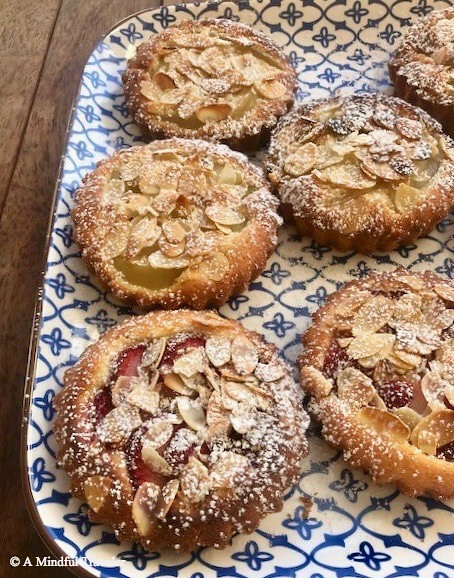 With inspiration from this beautiful region of France, here is one of my favourite tart recipes. There are a few variations to this recipe as well. 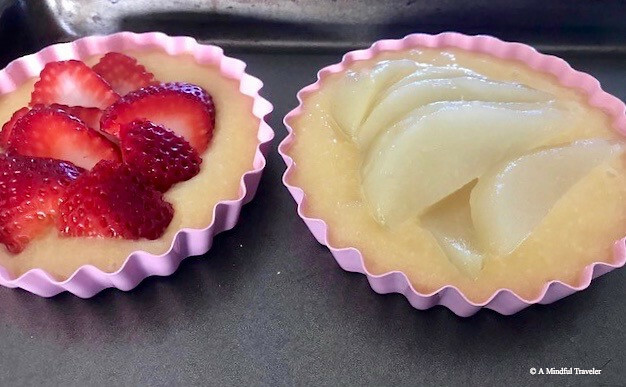 As for the fruit filling, I have used poached pears in one and strawberries in the other. Peaches, plums or stewed apples are also an alternative. I have also included an option for a chocolate tart base by simply adding 50g of cocoa into the dry ingredients. *If you are poaching your own pears, peel the pears and place in a saucepan of water with a stick of cinnamon, few cloves and a piece of orange peel. Make sure the water covers the pears and bring to the boil. Simmer and cook uncovered for 40 mins or until pears are soft. Lightly grease 6 x 7cm loose bottom tart tins. Melt the butter in a small pan till golden brown, and allow to cool. Sift the flour and icing sugar (and cocoa, if making chocolate tarts) into a mixing bowl and stir in almond meal, lemon (or orange zest) and cooled melted butter. Using a fork beat the egg whites in a separate bowl till lightly frothy, and fold into the dry ingredients. Divide the mixture among the prepared tins and place the slices of fruit on top. Place the flaked almonds on top of the fruit and bake for 10 minutes. Reduce the heat to 170°C and bake a further 5 minutes or until golden. Dust tarts with icing sugar and serve warm with cream or ice-cream. These look so good and so easy to make different varieties of flavours too! These look so tasty. You’ve reminded me of the day in Villers Bretoneaux when we went to a bakery. We decided to buy a rhubarb tart to share. The girl behind the counter couldn’t understand why two of us only wanted one and really tried hard to sell us two. 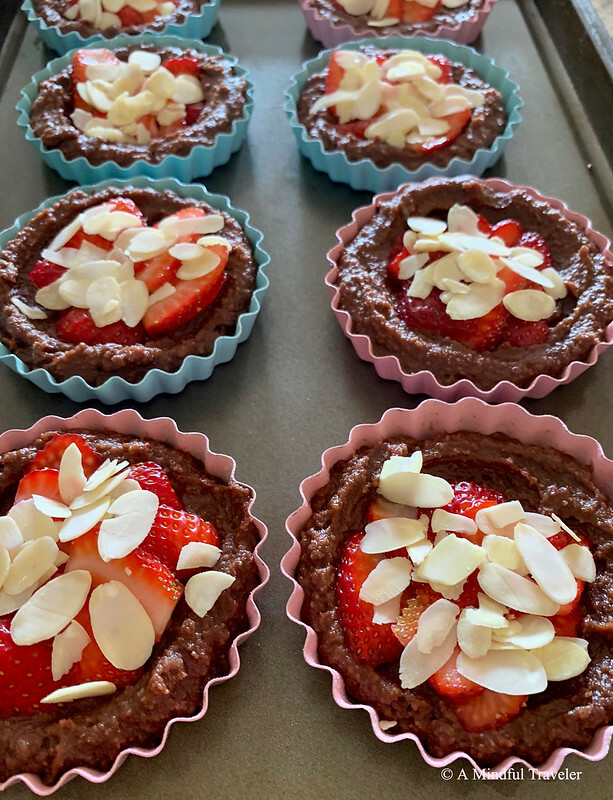 🙂 I suppose the idea of sharing instead of having one each of these delicious tarts would be a bit odd. Yum… beautiful & droolworthy post!!! Ooooh these look so yummy!! Tarts are my favourites! These look really lovely! 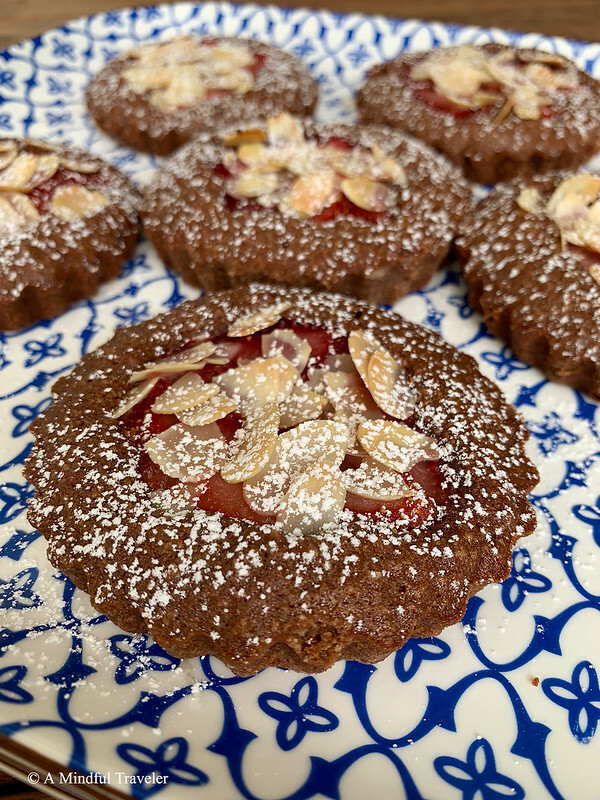 Lovely tarts, Lorelle do you mean ground almonds or an almond flour?